Mexico City, Mexico - His Grace Bishop Maxim of Western America made his third canonical visit to the Orthodox faithful in the capital city of Mexico from May 8-12, 2014. Accompanying His Grace was V. Rev. Blasko Paraklis, administrator of the Serbian mission there. They arrived on May 7. Per the decision of the Holy Assembly of Bishops of the Serbian Orthodox Church, the Serbian faithful in this country are placed under the pastoral care and canonical jurisdiction of the Bishop of Western America. During their visit they met with Serbian immigrants on numerous occasions, as well as with the Serbian Ambassador to Mexico Goran Mesic, who prepared a warm welcome for his distinguished guests at the Embassy. Also, Archbishop Alejo of the Orthodox Church in America and his clergy visited the guests from Los Angeles in the historic Mexico City. 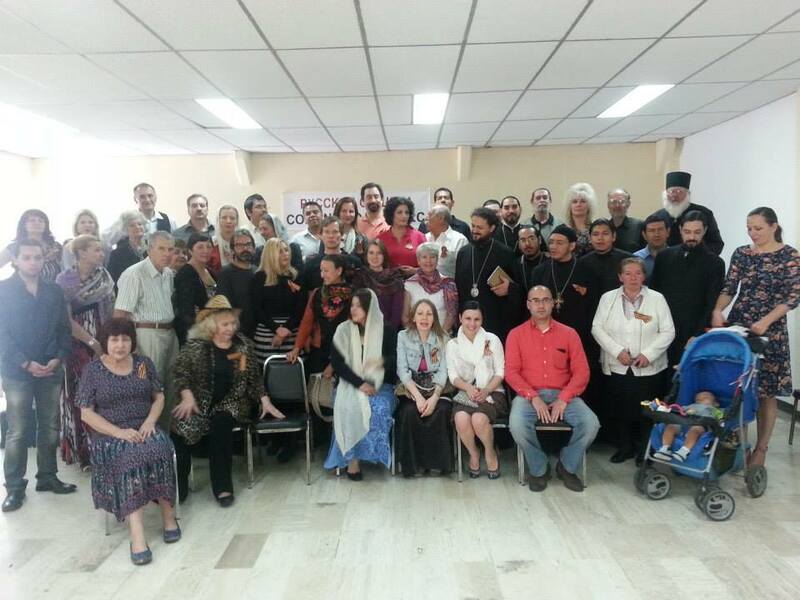 Archimandrite Nektarije Hadzi-Petropossa and the brotherhood of the Holy Trinity Monastery in Mexico City came to the aid in the efforts of coming to a liturgical gathering and meeting with our Orthodox people during this Paschal period. Orthodox Serbs living in Mexico City and surrounding areas were informed that the Holy Hierarchical Divine Liturgy would be served at the Russian monastery. Bishop Maxim served the liturgy on Sunday, May 11, joined by Archimandrite Nektarije, V. Rev. Blasko and Hieromonks Chrysostom and Arsenije (Mexicans who speak Serbian), in the presence of many Russian, Serbian, Mexican and other Orthodox parishioners, as well as the monastery brotherhood and Ambassador Goran Mesic and members of his cabinet. Following the liturgy the brotherhood prepared refreshments for all participants of the eucharistic celebration. On that occasion the guests from California presented as gifts various books from Sebastian Press. During this visit an informative meeting was held with the church board of this missionary parish, which will bear the name St. Nikolaj of Zicha. Members are: Sanja Savkic, Milena Markovic, Dejan Mihailovic Nikolajevic, Djordje Prokic and Vanja Ilic. V. Rev. Blasko Paraklis, parish administrator, is planning another visit to this Serbian mission in the fall of this year. Though the Serbian population in Mexico City is small it is striking considering their contribution to the people and country in which they live. Hospitality, traditional values, liveliness, openness...are the characteristics which contribute to the sights and bio-diversity making Mexico one of the most visited countries in the world. The icon of the Mother of God of Guadalupe (Nuestra Señora de Guadalupe) is one of the most popular and most visited Roman Catholic holy sites. The Orthodox in Mexico have the blessing of many bishops, three of whom live in Mexico: Athengoras (Ecumenical Patriarchate), Anthony (Antiochian), Alejo (OCA), while Bishop Kyrill (ROCOR) and Bishop Maxim make annual visits. The total number of Orthodox in this country is unknown but it is believed that there are at least 50,000. Orthodoxy would have a brighter future when that other side of the “jurisdictional” ties would act and when all would sing with one mouth and one heart the All Honorable and Glorious Name of the Holy Trinity, the Eternal Sabor – the Archetype of Church Sobornost. In the words of Bishop Atanasije, “the unity of the Church, in the graceful unity of con-celebration and communion of the Divine Eucharist, and the canonical unity of administration where 'all things should be done decently and in order' (1 Cor. 14:40), from Pentecost to this day, from Jerusalem to America, was also a gift and an event of the presence of the Holy Spirit – in the Church of the Apostles and Fathers, the Martyrs and faithful followers of the Lamb of God, of Which the Church is the God-Man Body, Community in One Spirit, the House of the Living God and Pillar and Fortress of Truth, salvation, Resurrection, eternal Life” (Contemporary ecclesiological reminder on the Diaspora, Sebastian Press, 2013, p. 83).